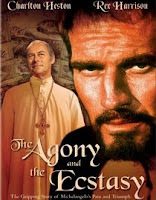 In this motion picture stars Charlton Heston as Michaelangelo Buonaroti, which I think is an excellent choice of actor because he imparts the strength of character that must have been Michaelangelo’s trademark. The first few minutes of the movie occur in a documentary style, describing Michaelangelo’s development as a sculptor rather than a painter. That sets the tone for the start of the movie when already in Rome, after a war campaign to extend the Papal States, Pope Julius II (Rex Harrison) commissions Michaelangelo to paint the ceiling of the Sistine Chapel. Michaelangelo opposes because he is a sculptor, but the Pope insists and eventually gets his way. In the film’s first hour, Michaelangelo debates whether he should go to Rome to paint the frescoes or go to Turkey to build a bridge. He escapes Rome after destroying the first two saints he has painted on the ceiling, and the Pope sends envoys to bring him back. Running away from the Pope’s envoys, he reaches the summit of a mountain, and there, watching a sunrise among the clouds, has a revelation about how the religious themes on the Sistine Chapel’s ceiling should be approached. In the second hour, there is a constant the battle of wills between the Pope and Michaelangelo to finish the ceiling. Despite good acting, I felt there was something missing to the movie, perhaps the script and supporting cast were not the best, which it was a pity.